MANASSAS, VA--(Marketwired - June 22, 2015) - Aurora Flight Sciences announced today that from June 12-15, 2015 the company's Centaur optionally piloted aircraft (OPA) flew multiple unmanned flights from Griffiss International Airport in Rome, New York. The successful test flights were conducted in full collaboration and compliance with Oneida County's Griffiss UAS Test Site, which is managed by Northeast UAS Airspace Integration Research Alliance (NUAIR). The flights marked the first time any large scale, fixed wing aircraft has flown at either of six FAA-designated unmanned aircraft test sites in the U.S.
"Having Centaur lead the way in the U.S. as the first large aircraft to fly in one of the FAA-approved test sites is an important milestone for our company, Griffiss, and the FAA," said Dr. John S. Langford, chairman and CEO of Aurora. "This aircraft is coming into high demand from a range of customers, both military and commercial interests, in the U.S. and abroad. The flights conducted at the Griffiss site enable our company to offer these customers an aircraft that has been at the leading edge of efforts to integrate unmanned aircraft into the U.S. national airspace." Aurora's Centaur OPA is a highly flexible, cost-effective airborne solution to a range of military and commercial unmanned aircraft requirements. The manned flight option enables access to airports worldwide without the need for large transport aircraft. Conversion to the unmanned flight mode, which is accomplished with minimal conversion time (under four hours) provides the flexibility needed for a wide range of applications. 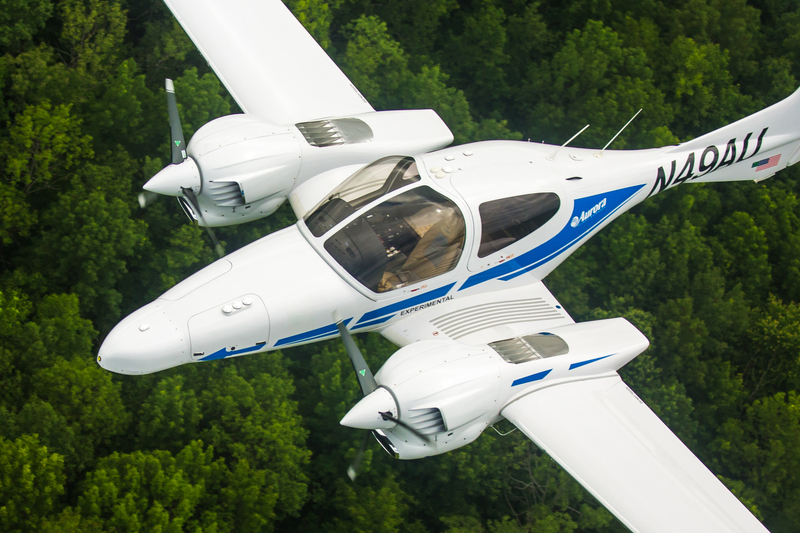 Centaur's small footprint, based on the Diamond DA42, provides an unmatched solution for clandestine operations and low profile ISR missions. And the platform supports an unmatched range of payload types and specifications, making it the optimal solution for numerous commercial and military applications. "Global interest in the Centaur has increased dramatically in recent months," said Langford. "And a number of customers have expressed interest in the one-two punch of combining Centaur's medium altitude, long-endurance capability with unique expertise acquired on other Aurora unmanned aircraft programs." In December, 2014 Aurora's Orion UAS shattered the world unmanned aircraft endurance record with an 80-hour flight. The previous record was 30.5 hours, set by a Global Hawk UAS in 2001. "Our proven long-endurance, medium altitude platforms are ready for action, whether deployed by the military for ISR missions, or in the skies meeting the needs of a wide range of other security, scientific or commercial applications," said Langford. Aurora Flight Sciences is a leader in the development and manufacturing of advanced aerospace vehicles. Aurora is headquartered in Manassas, VA and operates production plants in Bridgeport, WV and Columbus, MS; and a Research and Development Center in Cambridge, MA. To view recent press releases and more about Aurora please visit our website at www.aurora.aero.